If you have a Mac Pro, a Power Mac G5, or a Power Mac G4 or G3 with free drive bays, you can install an additional internal hard drive instead of upgrading your main one—it’s easy and takes only a few minutes. Regardless of which Mac you have, if you decide to replace your current internal hard drive, you’ll need to copy all your current hard drive’s files onto another storage device before you do the switcheroo. You can use an external desktop hard drive, use a second Mac in FireWire target disk mode, or burn DVDs. To ensure that nothing slips through the cracks (like your e-mail archive, bookmarks, fonts, and other important files), you might want to consider using drive-cloning software such as Bombich Software’s Carbon Copy Cloner ( ) or Shirt Pocket’s SuperDuper ( ), which easily and thoroughly duplicates your hard drive’s contents. Drive Compatibility Get a hard drive that matches the physical dimensions and connection interface of your Mac. MacBooks, MacBook Pros, and Mac minis use a 2.5-inch SATA drive, while PowerBooks and iBooks use a 2.5-inch ATA/IDE drive-SATA and ATA interfaces are not interchangeable. Likewise, recent Apple desktops (the Intel iMac, Mac Pro, iMac G5, and Power Mac G5) use a 3.5-inch SATA drive (the Mac Pro uses a SATA II drive), while older desktops (the iMac G3 and G4, and the Power Mac G3/G4) use a 3.5-inch ATA/IDE drive. Online retailers such as OWC provide Web guides that list storage options by Mac model. Capacity Internal 3.5-inch hard drives have capacities of up to 2TB, while 2.5-inch drives provide up to 500GB. Later G4s, all G5s, and all Intel Macs can accommodate any drive capacity, but the iMac G3, Power Mac G3 (blue and white), and early Power Mac G4 have a limit of 128GB. 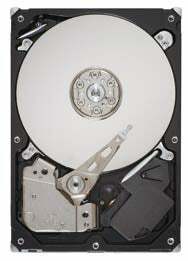 If you're looking for an internal hard drive, here are a few products to look at. We haven't tested and rated these products, but they should give you an idea of what's available. If you upgraded your Mac’s internal drive, what are you going to do with your old drive? Rather than stash it or trash it, you can easily (and inexpensively) convert it into an external hard drive. All you need is an enclosure. An enclosure is basically a shell to house an ATA/IDE or SATA 2.5- or 3.5-inch internal drive, providing power (bus power or a built-in supply) and connection interfaces. It also provides a convenient way to initialize a new internal drive, allowing you to enclose your new internal drive as an external drive, clone your old drive’s contents to it, and then swap the drives around. To build your own external drive, find an enclosure that supports your disk drive’s size and interface, preferred connection(s), and design aesthetic; OWC, NewEgg.com, and TigerDirect.com are good places to buy enclosures online. Look for one with a cooling fan (especially for larger capacity drives) or a heat dissipating design for better drive longevity. Installing a drive into an enclosure varies case by case. If you’re installing an ATA/IDE drive, make sure that the jumper setting is set to Master before installing (this doesn’t apply to SATA drives). Then mount the drive into the case, make any connections, close everything up, and you’re good to go. An alternative to using an enclosure is to use a dock. NewerTech’s Voyager Q ($100) or Voyager S2 ($60) lets you insert an internal hard drive into its docking device and use it like an external drive, making swapping drives easy.